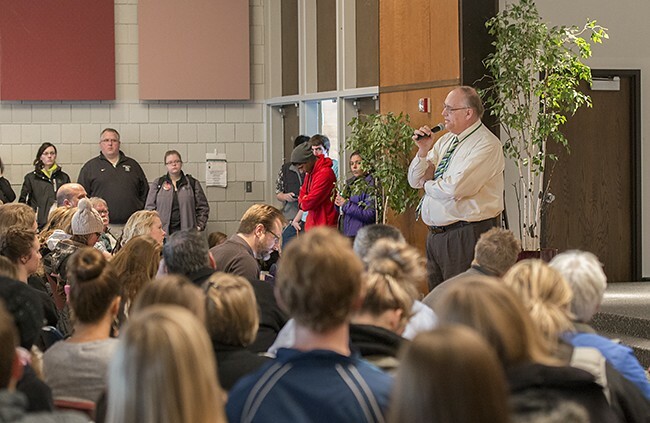 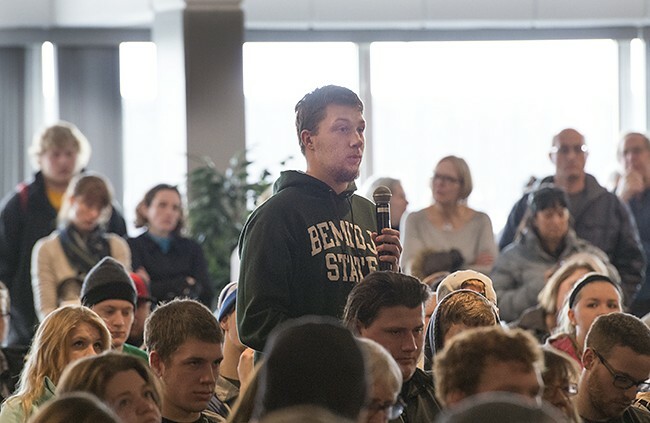 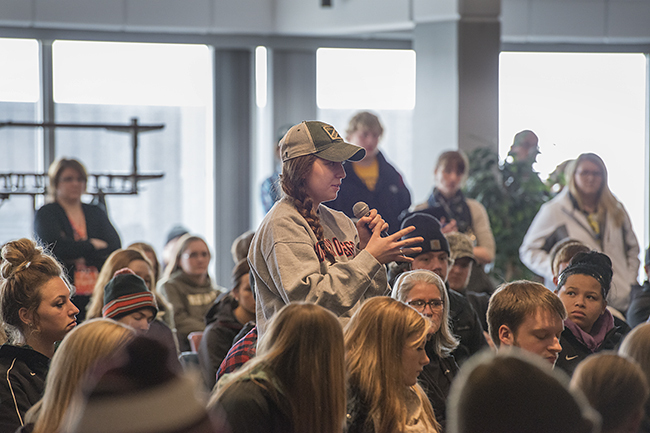 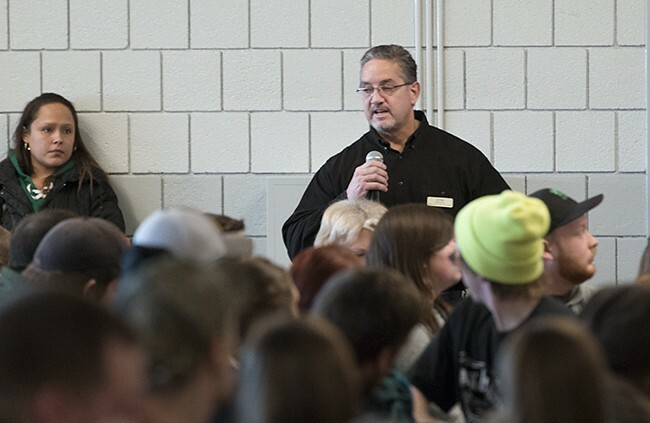 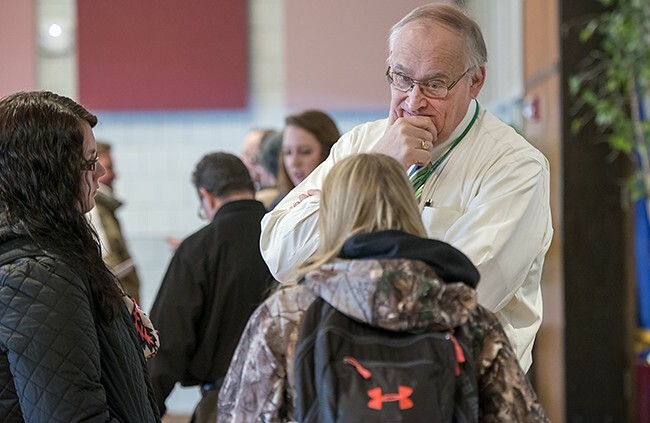 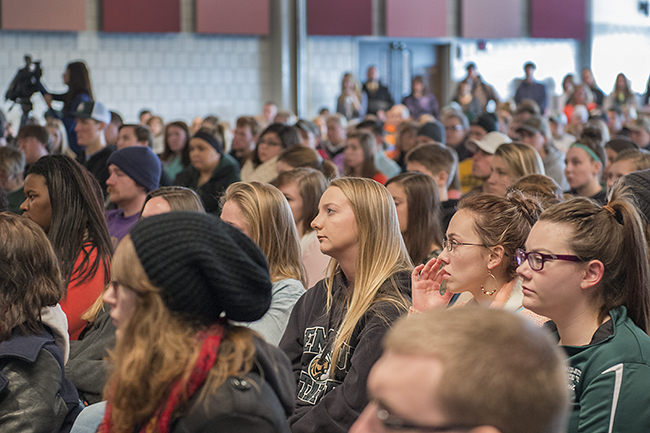 Bemidji State University President Richard A. Hanson challenged nearly 500 students at a campus-wide gathering Thursday to confront the dangers of alcohol abuse, and they shared their ideas for improving safety and promoting responsible behavior. 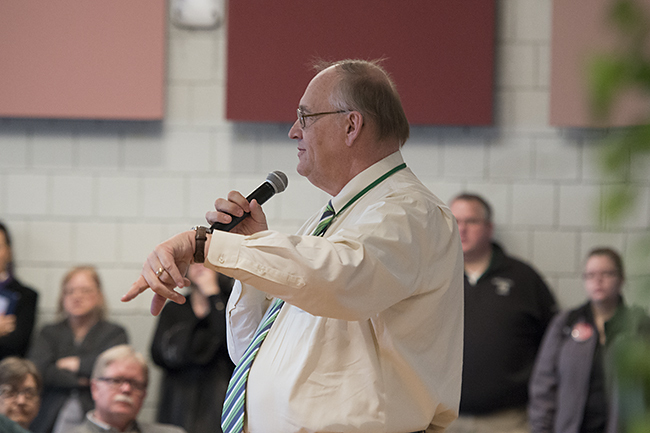 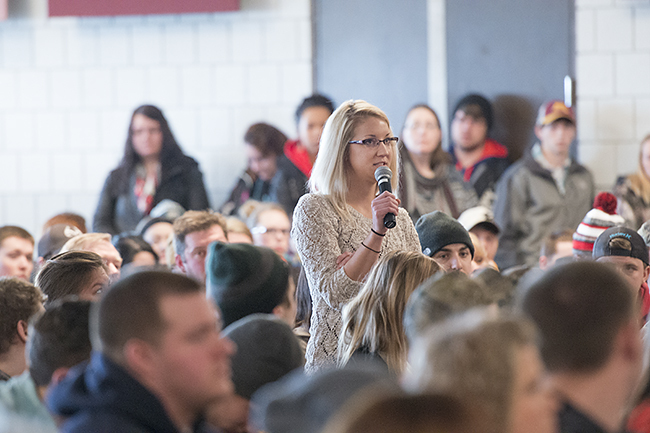 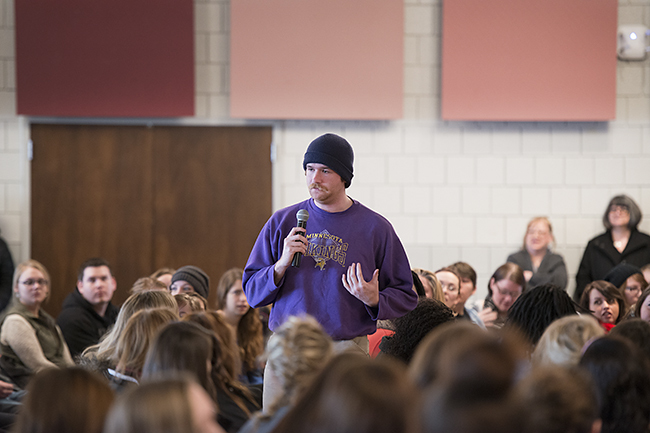 One of the many in attendance who shared their own insights into alcohol use and student safety during the summit’s question and answer session. 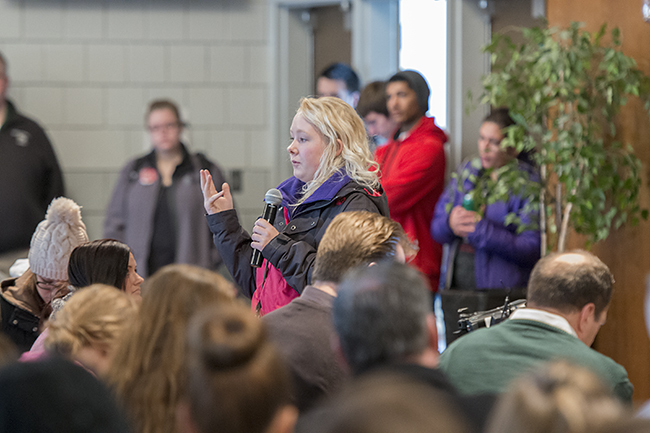 President Hanson talks with students during the BSU Summit on Alcohol and Student Safety. 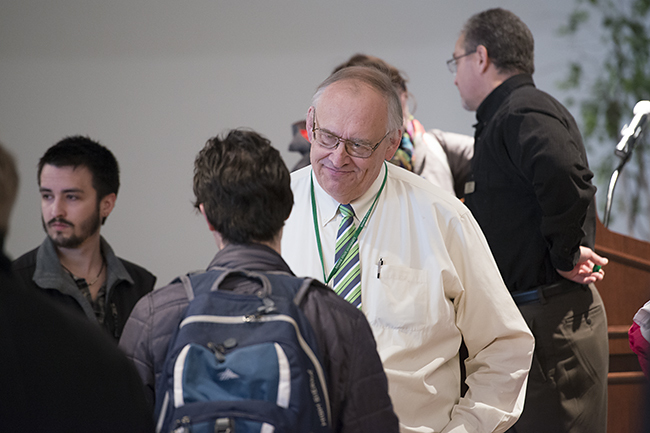 President Hanson talks with a student after the summit. 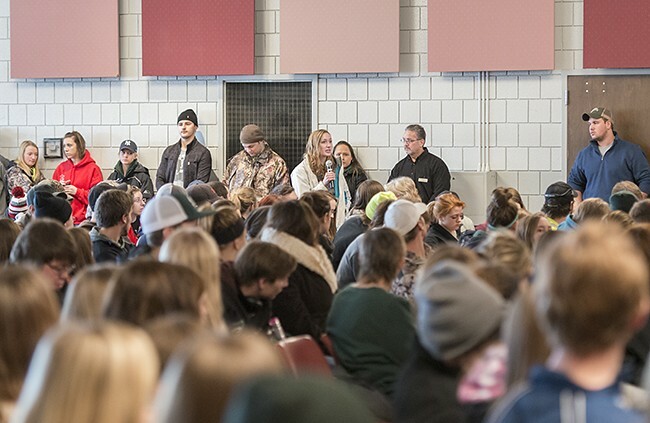 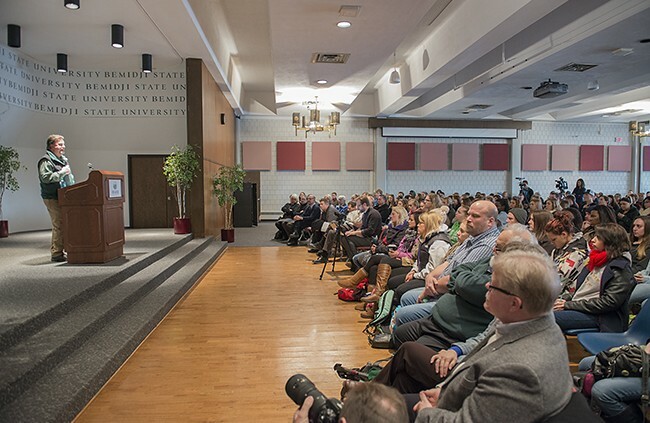 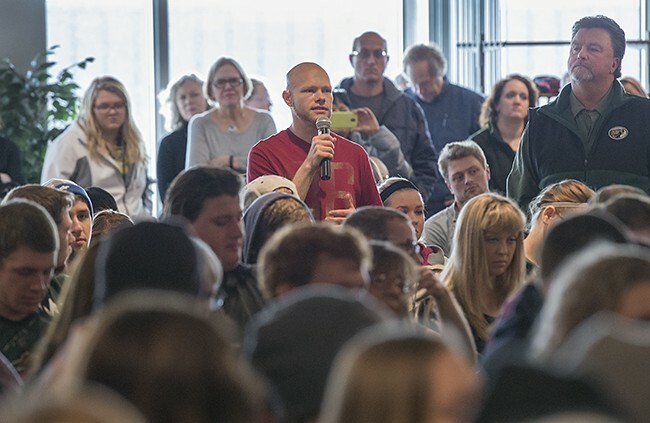 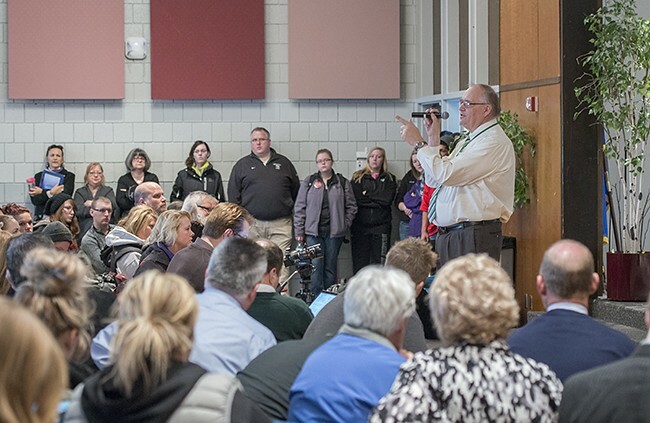 A crowd of Bemidji State University faculty, staff and students estimated to be over 500 attended a Campus Summit on Alcohol and Student Safety in the Beaux Arts Ballroom. 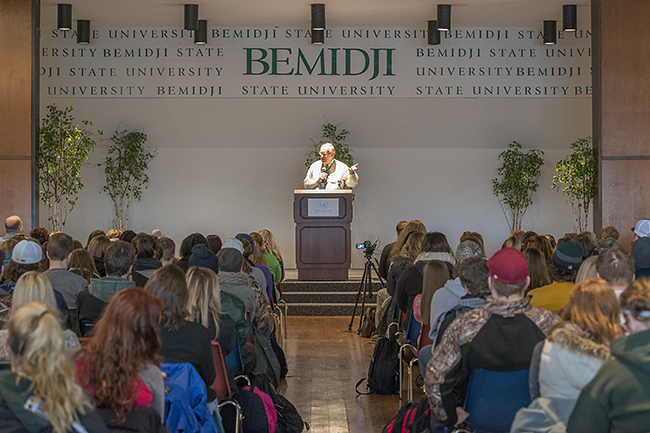 Dr. Marty J. Wolf, a professor of computer science at Bemidji State University, explores the ethical considerations surrounding not only the latest wave of augmented-reality devices such as Google Glass, but what future versions of this technology might hold, as part of BSU’s Honors Council Lecture Series. Dr. Richard A. Hanson, president of Bemidji State University and Northwest Technical College, issued the following message to the faculties and staffs at both campuses today regarding Minnesota Governor Mark Dayton’s recommendations for the state’s FY2016-17 budget. Dayton’s proposal does not include the system’s request for additional funding. After a year-long redesign and construction effort, Bemidji State University is unveiling its new Talley Gallery with an exhibition by local artist Jennifer Nelson. 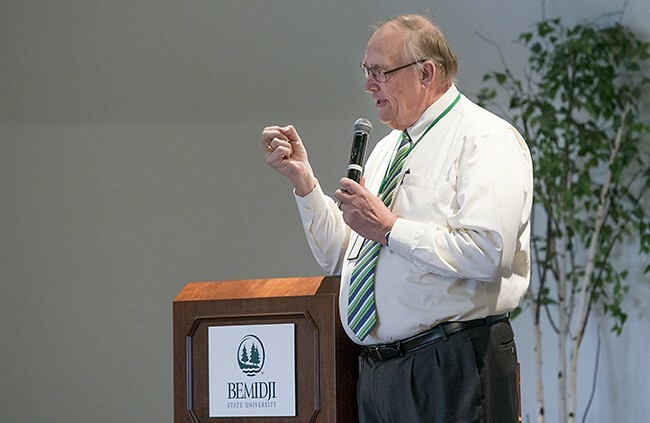 Registered nurses in northwest Minnesota seeking to continue their educations can now pursue a bachelor’s degree in nursing from Bemidji State University at Northland Community and Technical College’s campus in East Grand Forks, Minn. 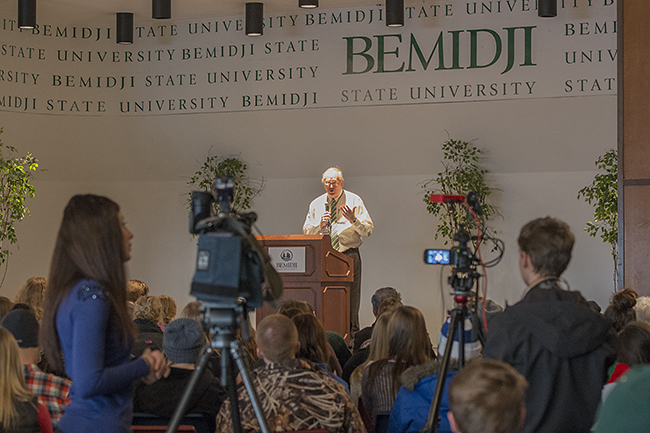 The renovation of Bemidji State University’s Memorial Hall is underway and remains on schedule for completion during the summer of 2015. 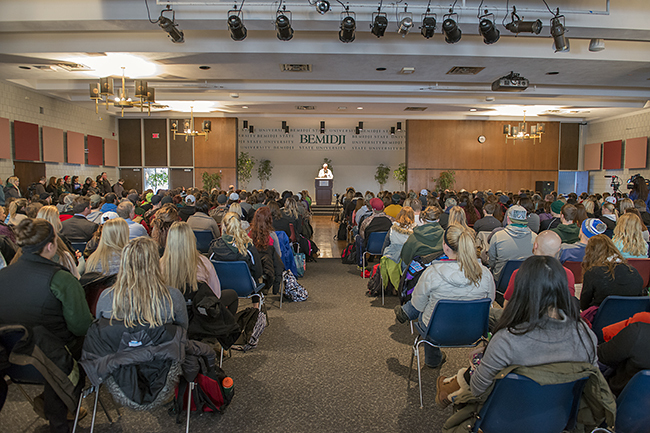 Dr. Vivian Delgado, assistant professor of indigenous native nations studies, explores the importance of cultural standards in education for supporting both educational and cultural well-being as part of BSU’s Honors Council Lecture Series. Beginning Feb. 5, Bemidji State University students will be donating their time to offer free services as part of of the Internal Revenue Service’s Volunteer Income Tax Assistance program. Nurses with an affinity for the outdoors can pursue one of the nation’s only graduate certificate programs in camp nursing at Bemidji State University. BSU’s certificate in camp nursing, offered entirely online, prepares registered nurses for camp nursing practice, which offers a blend of clinical, community health and emergency response skills.